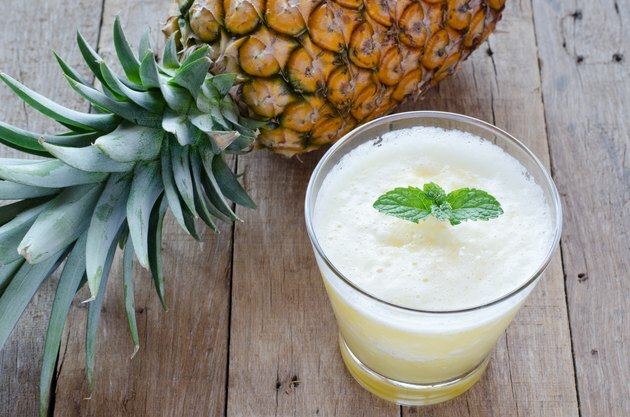 Pineapples and pineapple juice contain bromelain, a combination of protein-digesting enzymes found nowhere else. Historically, people in South America used pineapple to treat stomach ailments and inflammation, states the University of Maryland Medical Center. Modern scientific researchers have examined bromelain's efficacy in treating numerous medical conditions, but additional research is needed to confirm bromelain's potential value and recommended dosage/delivery method for the majority of these. Consult your doctor before taking bromelain to treat any medical condition. UMMC recommends supplemental bromelain tablets over fresh pineapple juice, claiming that pineapple juice doesn't have high enough concentrations of bromelain to be effective. However, the Dole Nutrition Lab disagrees, explaining that fresh and even frozen pineapple juice demonstrated greater enzymatic activity when compared to six bromelain supplements. These researchers point out that in addition to bromelain, pineapple juice is also an excellent source of both vitamin C and manganese. Bromelain's usefulness for treating arthritis remains in question. A study published in the December 2006 issue of the medical journal "QJM" found that 800 milligrams of bromelain daily had no effect on osteoarthritis of the knee. However, scientists found that patients with painful hip osteoarthritis experienced similar improvements in symptoms whether they took a nonsteroidal anti-inflammatory or an oral enzyme formulation that is a combination of bromelain, trypsin and rutoside, as reported in the January-February 2006 issue of "Clinical and Experimental Rheumatology." Bromelain's ability to effect pain relief for general purposes continues to be uncertain. Research reported in the December 2002 issue of "Phytomedicine" found that doses of both 200 and 400 mg of bromelain daily helped reduce knee pain in otherwise healthy adults. However, a study published in the November 2002 issue of "Clinical Journal of Sport Medicine" found that neither ibuprofen nor bromelain helped the study's subjects experience relief from delayed onset muscle soreness. Bromelain shows promise for treating swelling and inflammation. Oral bromelain supplementation promoted faster healing in rats with acute tendon injuries, according to a study reported in the January 2011 issue of "Phytotherapy Research." UMMC states that bromelain may shorten the healing time for sports injuries, surgical procedures, burns and wounds. When applied directly to the skin, bromelain might also help lessen swelling from bug bites and stings. A study reported in the March-April 2005 issue of "In Vivo" concluded that bromelain significantly improved symptoms of sinusitis in children. Bromelain might also increase the absorption of antibiotics, explains MedlinePlus, in addition to possibly inhibiting tumor growth and reducing blood clotting. Other potential applications include using bromelain to combat viral and bacterial infections, hay fever, heartburn, irritable bowel syndrome and other digestive ailments, notes UMMC.